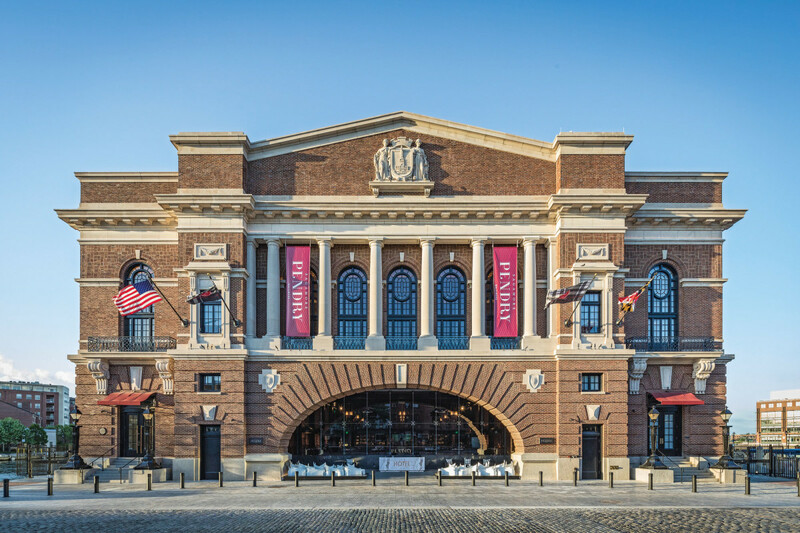 After a rehabilitation led by Beatty Harvey Coco Architects, the historic Sagamore Pendry Hotel is once again drawing patrons to Baltimore’s Fells Point neighborhood. 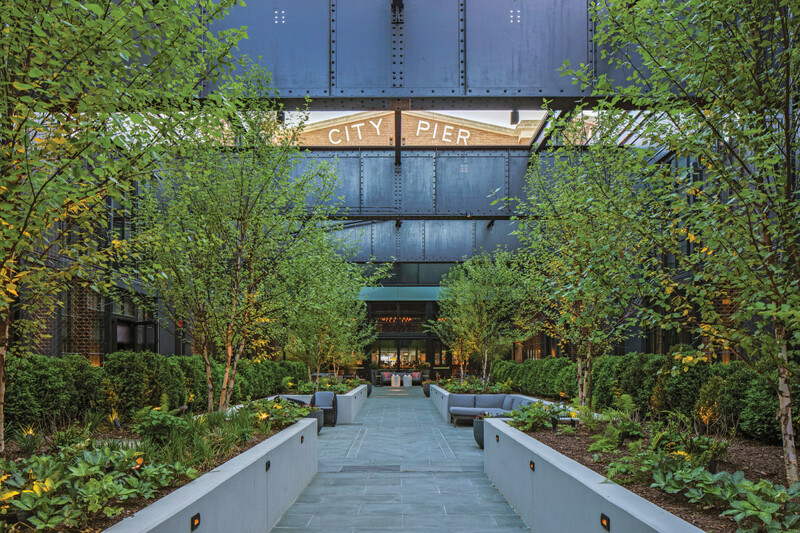 In 2017, a long-awaited luxury hotel, the Sagamore Pendry, opened in a landmark Beaux Arts building on Baltimore’s historic Recreation Pier. 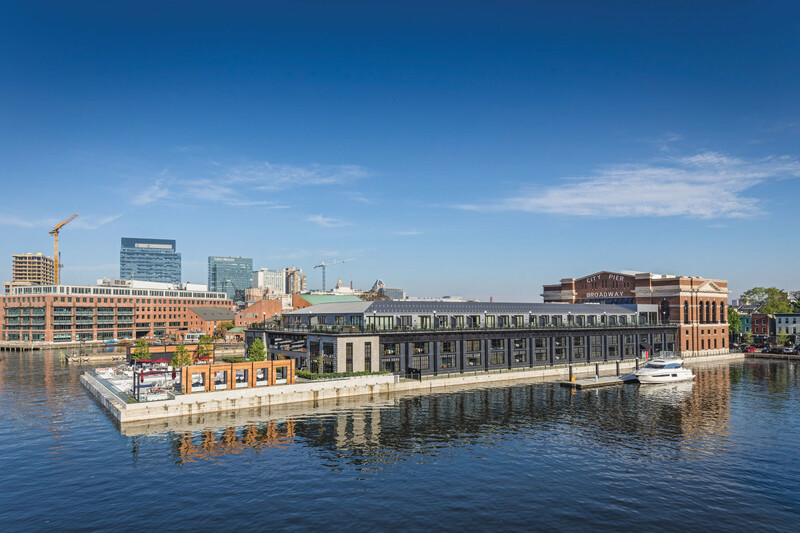 The waterfront hotel’s grand opening followed a two-year, $60-million restoration of the building and pier, which had stood vacant and in disrepair for 15 years in Baltimore’s historic Fell’s Point neighborhood. 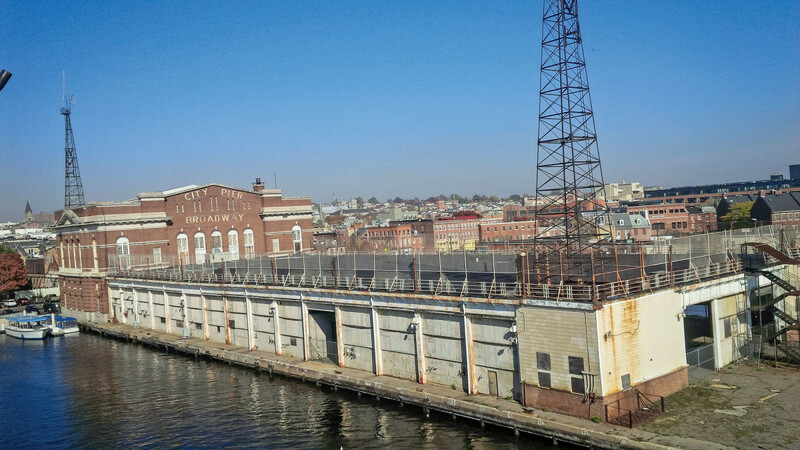 The building’s original architect was Theodore Wells Pietsch, and, following its construction in 1914 as a commercial pier, it also served at different times as the country’s second-largest immigration landing point, a storage facility, a community center, the set for the TV show Homicide Life on the Streets, and as the offices and dock for a tugboat company. 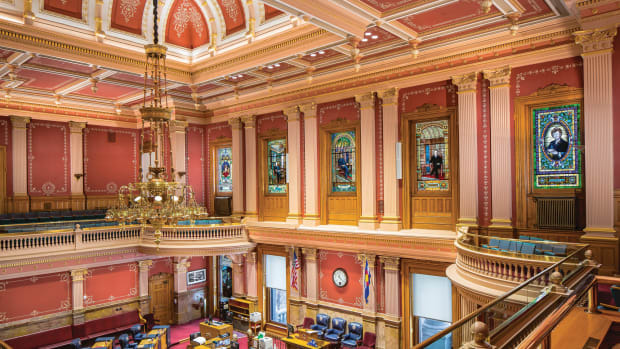 Considerable time was also spent documenting existing conditions, since no original drawings for the building were available. 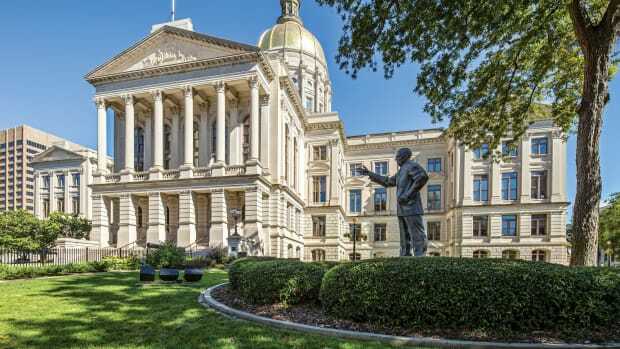 Says Harvey, “We hired a company, Trimble, to do laser surveys of the interior of the building to create existing plans for all the moldings and all the detailing in the ballroom. Restoration included the wood windows, which had to be replaced or completely rebuilt, as well as the brickwork, stone and coping. The windows, which had been painted a cream color, were repainted to their original black. The original clear, single-pane glass was replaced with new glass to match. The historic building and pier had stood vacant and in disrepair for 15 years. Renovations over the years had covered up the original paint on the walls and on the plaster, and there were no color photographs from the original building. 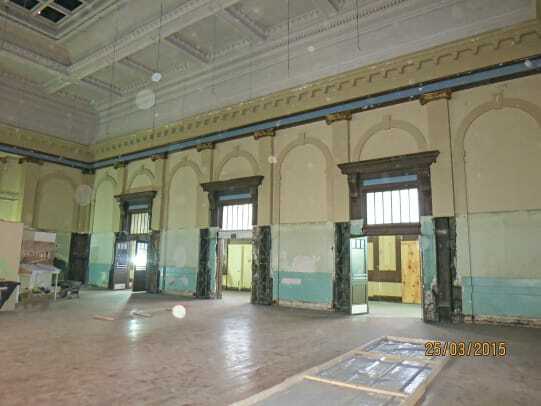 But the key elements—the original coffered ceilings, moldings and maple wood floor were in very good shape. This view of the completed project shows hotel and pier surrounded on three sides by water. 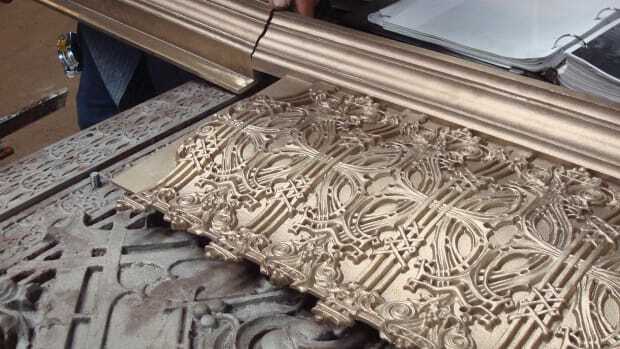 Boyd replaced the extensive damaged crown molding, taking samples of the ornament to his warehouse and making molds to create new pieces. He applied a bonding agent, mixing plaster and adding sand to match existing sand finishes on corridor walls. In the ballroom, Boyd replaced the original lime plaster that had been weakened by extensive leaks, with gypsum plaster. 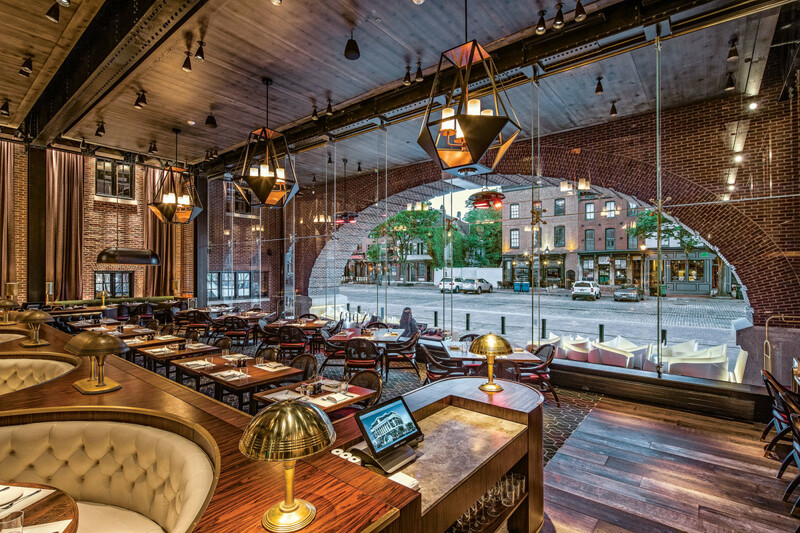 A modern glass wall was inserted into the arch on Thames Street that had been used as a truck driveway, opening space for the restaurant and lobby. In contrast to the relatively well-preserved main building, the pier building had been an open warehouse, with large overhead doors around the perimeter to allow ships to unload and trucks to pick up and deliver cargo. Existing walls and roof materials had deteriorated to a point beyond restoration. “Working with the Maryland Historic Trust and the National Park Service, we developed a design with all new materials—insulated glass doors and windows,” says Harvey. “It was in the same vocabulary as the original architecture, but it was not a restoration. An open-air courtyard provides an outdoor space for hotel guests and features sculpture by renown artist Fernando Botero. During the pier restoration, three historic cannons were discovered in the harbor, removed and put in a vat of bay water to preserve them in their original environment. They were then cleaned, repaired, restored and painted and used to add another historical dimension to the hotel, with two framing the entry to the rear pool deck and one visible through the floor in the whiskey bar. The hotel’s waterfront location presented other issues. Floodplain requirements made it necessary to raise the floor of the building by three feet and flood-proof the perimeter of the building. Sutton says the hotel’s design conveys two stories: that of Baltimore’s industrial past and that the national anthem was written within a thousand yards of the hotel. Those histories were expressed through some of the industrial elements retained and added throughout and by a wall of laser-cut steel at the entrance, whose cut-out letters make up the stanzas of The Star Spangled Banner. Another angle of the open-air courtyard. 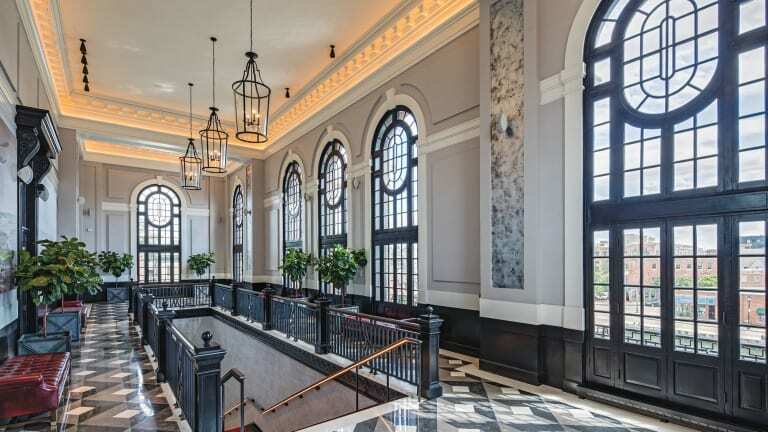 The oak-paneled arrival hallway features a series of brass wall sculptures depicting Baltimore icons such as the blue crab and Edgar Allen Poe, and the bronze reception desk was designed to evoke a flag billowing in the breeze. The guest rooms, which overlook the water, were designed with mahogany louvers and nautical brass accents, so guests would feel as if they were sleeping in the captain’s berth of a ship. Eva Leonard is a New York City-based freelance writer whose outlets include The Architect’s Newspaper, The Designer, Landscape Architecture Magazine, and Modern Luxury Interiors South Florida. Her RetroQuesting site and blog is devoted to historic architecture and adaptive reuse.